Last night for no particular reason I searched for ‘dulcimer” on Ebay. Imagine my surprise when I saw a photograph of myself as an illustration for a “product” I have nothing to do with. 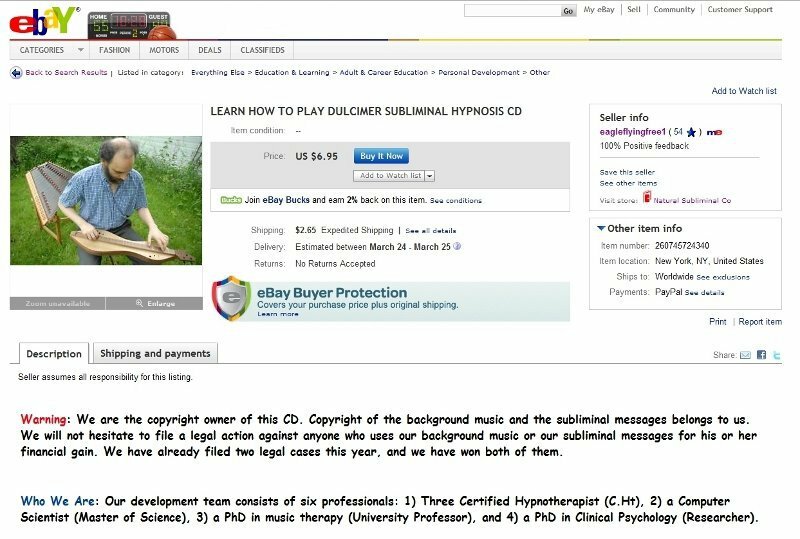 There I was, visually associated with a CD that would hypnotize you and give you subliminal suggestions to make you a dulcimer player. Really. I am not making this up! For the record, I have NOTHING TO DO WITH THIS! I was amused that the advertisement began with a stern warning that these folks owned the copyright on their CDs and would prosecute anyone copying their product. They did not seem to extrapolate from this concern that perhaps they should not use my photograph without my permission. I wrote to these folks telling them that I have nothing to do with their product and that I do not want them using my photograph. I also let them know that they were in violation of my copyright on the photograph. They did reply and I was told they were sorry for the “accident.” Accident? Did someone trip and accidentally fall on a keyboard causing a search, cut and paste of a photograph on my website? Well, stranger things have happened. They said they would remove my photograph and indeed they have. There is now a photograph of a dulcimer and hammered dulcimer no doubt taken from someone else’s page. In over 30 years of playing the dulcimer and hammered dulcimer I have never felt the need for using hypnosis and subliminal messages to enable me to be a player. Devotion, immersion, dedication and perhaps obsession came in handy as did a lot of study and practice. As for subliminal messages, my general opinion is that if I can not hear the words being spoken, then they are probably not telling me anything. A bit late for this… but a great way to deal with “web theft” is this… most people actually just steall the link to your photograph. When this happens, you change the photo name and link on your website but keep the original link (but don’t post it) The new photograph (you just change the name to match the old link) should be something gracefully obscene… I’m sure you could use your imagination. It’s great revenge! I did find the experience somewhat surreal. Sounds like a shady operation at best. I just read their product description – it sounds like they may be in copyright or patent violation of Professor Harold Hill. Gosh Doug, I cannot believe these people did this…. I dunno, Doug. I’m giving serious consideration to that hypnosis idea . . . I looked at their listing, and it seems they have dropped your photo in favor of using one from the web site of a man named Stephen Baird. Of course I’m sure these ethical folks got his approval first so as to not violate any copyright issues. Years ago someone asked a friend of mine, a phenomenal guitarist, how she got to be so good. She said she told them that while they were out learning job skills she played guitar all the time. Often teaching music invloves being supportive and helping people feel confortable and safe while trying somthing new but this hypnosis/subliminal CD sounds like a riediculous idea. I looked at their othger listings and they offer CDs so you can learn drafting any many other things. That’s certainly a lot of brainpower devoted to subliminal dulcimer learning. I wonder what else these people are up to with their proven technique? At least they took the pic down, but that was an open & shut case of copyright violation. & what a truly strange concept! Tho someone once asked me if I offered a program where they could “learn the guitar in 6 lessons.” Maybe they had seen this product. Thanks, all. I actually think hypnosis can be a wonderful tool but this is ridiculous. I think the irony of these folks is how protectivce they are of their own work while not respcting the work of others. It wouldn’t give me much confidence in trying out their stuff! Similarly strange feeling when I found myself quoted in an ad without having given permission. That was a bit defensible. This is not. I’m glad they took the picture down. Gee, Doug, that’s wild. Never in your wildest imaginations. . .
Perhaps hypnosis is what you need to go to that next level! Heh-heh!